This master ensuite forms part of a dynamic modern extension – by designer Jason Klumpp – to a narrow, traditional home. To bring natural light into the three-level rear addition, a glass-roofed, double-height conservatory runs along the side of the new structure. And the ensuite, on the top floor of the addition, extends out over the upper reaches of this soaring volume. However, the architectural gymnastics of the master bathroom are only part of this design story. The ensuite is in tune with the modern design language of the new extension while also referencing the existing part of the classic home. The two-tone bathroom includes a feature wall with the classical look of veined marble. This steps out at one end to define the separate zones for bathing and showering and also to conceal roof drainage for the building. And the vanity on the wall opposite is finished in the same material. 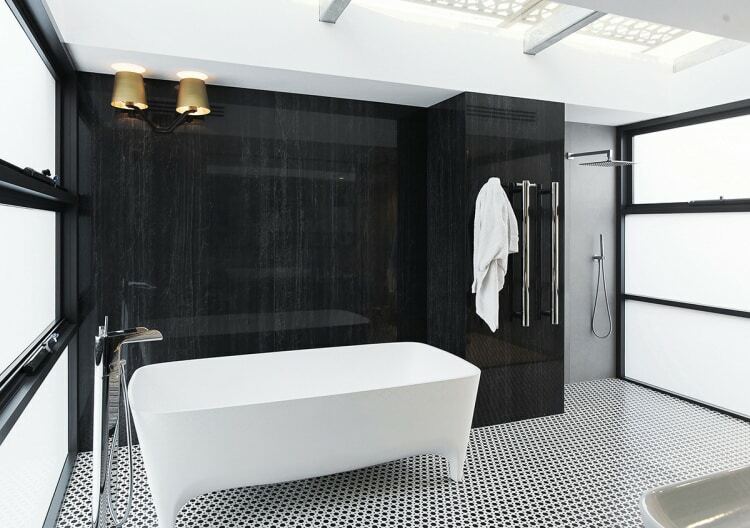 While the dramatic, dark surface has a natural appeal, in fact it’s a contemporary, large-format yet slender porcelain sheet that effectively mimics the character of stone. The modern, mirrored wall cabinet above the vanity offers storage and a sense of spaciousness. Another contemporary aspect of the room is the laser-cut screen ceiling that floods sunlight from tinted glass down into the bathroom proper. Natural light also filters into the room via the shoji screen-like end wall panels in translucent glass. The outer panels on these end walls, however, are in an opaque, marble-like finish. A more specific reference to the period of the original residence is seen in the choice of the classic sconces directly above the tub. Completing the two-tone theme, the bathroom floor is finished in black and white mosaic tile custom made for the project. Chrome could be considered the third colour in the room, with the rainhead shower, freestanding tub pourer and heated towel rails all in this shiny finish. In fact, you’d be forgiven for missing the heated rails at a glance – these are the vertical ‘handles’ on the tall cabinet. “The family bathroom, in the original section of the home, has similar finishes and features,” says Klumpp.